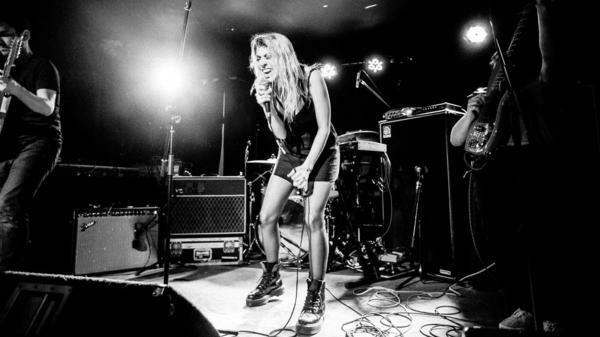 Isn't Charly Bliss just the sound of pure delight? The power-pop four-piece combine grungy, distorted guitars with singer Eva Hendricks' irrepressibly bubbly voice and knack for sugary hooks, like a headrush of Pop Rocks and bubblegum. We fell in love with the band's debut album, Guppy, last year, and have been awaiting new tracks from the Brooklyn group ever since. Today, the band releases "Heaven," a swoon-worthy single complete with a totally singalong-able chorus, a slow-burning guitar solo and spoke-sung breakdown where Hendricks promises to "buy a house / and fill it with daughters." We'll meet you there. Charly Bliss starts a tour with Death Cab for Cutie on Sept. 24.